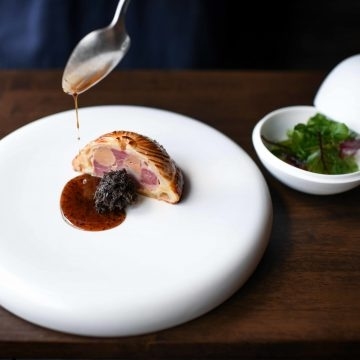 Coi is the newest restaurant to earn three Michelin stars, giving San Francisco the most three-star restaurants of any city in the U.S. — at least until Michelin debuts New York City’s stars next week. took over as executive chef at Coi in 2016 after chef/owner Daniel Patterson stepped down. Since then, his $250 local seafood-focused tasting menus have earned the restaurant a three-and-a-half star review in the San Francisco Chronicle, and now, Michelin’s highest honor. Dice the chicken into large cubes. Blend all ingredients except the heavy crème together using a robot coup. Once the mixture is smooth, start slowly streaming in the heavy crème until it has combined well into a mousse. Pass through a tamis and cryovac to store. Grind all ingredients with the small die of a Kitchen Aid grinding attachment (except the calvados). Paddle the ground farce in the Kitchen Aid until the meat begins to pull away from the sides of the bowl – about 30 seconds. Paddle an additional 15 seconds or so while you stream in the calvados. Cryovac the mixture and chill it down immediately. Season the whole duck breasts with the foie gras cure. In a shallow plastic hotel pan, lay out the duck breasts, chicken thighs and sweetbreads in an even layer. Sprinkle peppercorns and shallots evenly over the top, then sprinkle the calvados evenly over the top, cover with plastic wrap and press plastic down to cover the meat. Marinate for 3 hours then flip, re-cover and marinate for an additional 3 hours. Rinse the breasts, pat them dry and dice to into 2cm cubes. Add the foie gras to the rest of the meat and mix. Combine the course ground farce and mousse, ensuring even distribution. Season with salt and reserve in cryovac bag. Combine both ingredients evenly mixing gently with gloved hands working in a bowl over an ice bath. Weigh the finished mixture into 200 gram balls – there should be 13 balls. Press the balls in the inside of an 8oz ladle lined with food service film. Wrap the balls in the film after they are formed. Complete all these steps whilst in the cooler. Punch the puff pastry into 16cm rounds with a pastry ring cutter. Slightly freeze the bird mix. Lay one round down and dock liberally using a fork. Brush the edges of the pastry with egg wash.
Place a 200g ball of the final tourte mix in the center of the pastry round. Top the ball with another 16cm puff pastry round and working carefully, start forming the pastry around the top of the ball – make sure you aren’t stretching or folding the dough. Once completed, crimp all sides of the dough where they meet at the bottom. Crimp edges again with a fork to seal and then punch out again to trim the edges evenly. Dock all around the tourte at the very bottom directly above the edge, then use a cake tester to poke holes around the entire pastry at the very bottom. Egg wash the completed tourte, and allow to sit for 30 minutes. Egg wash the tourte again after 30 min, and then again after a further 30 minutes – the pastry should be washed a total of 3 times. After the third egg wash, use a #804 pastry tip to punch out a vent on the very top center of the tourte – the vent must be perfectly centered. Score the pastry in curved lines leaving 1cm between each of the lines. Bake tourte at 190°C convection for 10 minutes, then rotate and bake for an additional 6 minutes. Allow the tourte to rest for 30 min before slicing. Make a simple syrup with the water and sucrose. Add the zest of 1 lemon and the split vanilla beans. Place prunes in 8 quart cambro and pour boiling syrup over prunes. Allow to steep at room temperature for 24 hours. After 24 hours, pass the mixture, reserving the liquid but discarding the lemon and vanilla beans. Combine prune liquid and Armagnac by placing prunes in glass jar and pouring Armagnac liquid over the top. Seal and allow to sit for 1 month. Pass the cured prunes through a chinois, separating the prunes from the liquid. Add prunes to the blender and blend on high adding just enough of the liquid to make the prunes into a silky pure. Finish with a knob of whole butter, and season with salt as needed.